This version of the Holmes blog came to me via LinkedIn. I've replaced "Entrepreneur" of the original headline with "Association Executive." As you read this blog, feel free to substitute "members" for "customers" if that makes you feel better. In reality, our members are our customers. And our members/customers experience much more than just our associations and these experiences impact member/customer expectations of their associations. If you just build it, they probably won’t come. In the era of Amazon, Yelp and Rotten Tomatoes, buyers are increasingly choosy when it comes to what they’ll spend their money on. To woo potential clients, brands have to offer something extraordinary. And then there’s the small issue of retaining those new customers. I’ve noticed that in the race to win consumers’ hearts (and wallets), entrepreneurs—from restaurants to software vendors—are increasingly turning to an old-fashioned fix. Their quaint recipe for success: Don’t make the customer come to you. Go to them. These companies—many of which just so happen to be household names—have all found ways to make it easier for clients to engage and transactions to happen. Think of it as door-to-door sales for the digital age. Food trucks: Bringing tasty, affordable cuisine straight to the customer. The explosive growth in popularity of food trucks in North America over the past few years has been hard to miss. Food trucks are featured on reality TV shows, they’re being Zagat ratedand they’re the focus of hundreds of adoring blogs and massive media coverage. Why? 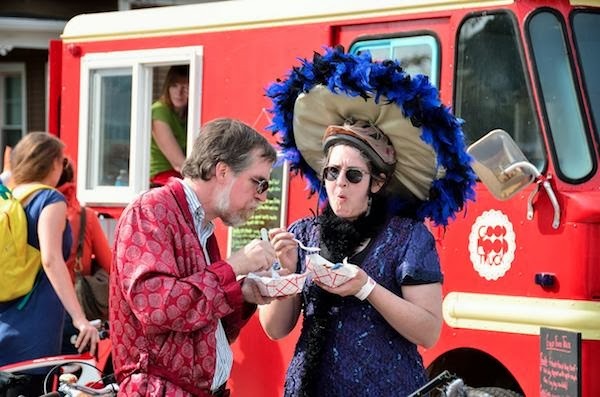 Food trucks did what most bricks-and-mortar restaurants couldn’t. They brought their tasty, affordable offerings straight to the festivals, street corners, and office buildings where their target consumers live, work and eat. Forward-thinking vendors chose a new, more direct way to reach their target consumers. I think there’s a lesson there for all of us. Zipcar: Convenient transportation for people who didn’t even know they needed it. When Zipcar first emerged in the early 2000s, it seemed like a far-fetched idea. Sharing cars? Ten years later, the company is at the head of a flourishing worldwide car-sharing industry. In fact, earlier this year one of the world’s most established car-rental brands Avis Budget Company, purchased Zipcar for a cool $500 million. Why did Zipcar take off? For starters, they parked their rentals along streets in heavily trafficked urban neighbourhoods—right under their target customers’ noses. Zipcar brought cars to drivers instead of waiting for drivers to come to them. Sprinkle in a bit of tech savvy behind the scenes and convenient registration and you’ve got a formula for success. Netflix: Home entertainment straight to your doorstep. . . and TV screen. It’s hard to believe that less than 10 years ago, Netflix was David to the then-Goliath Blockbuster movie rental chain. Fast forward to the present and Blockbuster is nearly defunct, while Netflix has turned the video rental industry on its head, changing the way that people consume home entertainment. And the company shows no signs of slowing down, having hit all-time stock highs this year. Netflix’ enormous success over the past decade is of course largely due to the fact that it skipped storefronts and instead reached its target consumers more directly via the internet and their mailboxes. By taking this non-traditional approach, Netflix was able to reach and lock down a loyal new consumer base. Square: Easy, on-the-go transactions in the palm of your hand. A friend of mine was recently blown away when he went scuba diving in the tropics and was able to pay for his equipment and training session on the beach using his iPhone. Three years since its launch, Square has become a runaway hit, giving merchants armed with just an iPhone the ability to conduct seamless credit card transactions—from anywhere. Today, over 3 million merchants have signed up for the Square transaction service to process $12 billion a year in transactions. By taking the point of transaction to the consumer rather than making the consumer come to the point of transaction, Square has transformed how we shop. In just under a decade, social media has emerged as a game-changing technology, forever altering the way we communicate with each other—at home and at work. At my company we’ve recently added a new tool that lets people tap into social media easier than ever before. With the Hootlet, users can (while browsing the web) immediately share anything they find to Facebook, Twitter, Google+ and more, without ever leaving the window. They can also search for geo-specific social media messages by others in real-time, all from within familiar platforms like Google Maps or Yelp. In short, we've taken a page from the food truck strategy, bringing social media directly to our users, rather than making them go to social media. Once installed into your Chrome browser, the free Hootlet is there instantly, adding a social element to anything you do on the web. How do extraordinary brands win your heart? Do you prefer that companies come to you? Did you like this post? To read my weekly insights on social media, leadership, and tech trends, just click the 'follow' button at the top of this page. For more social media insight and to learn more about my company, follow HootSuite on LinkedIn. Does Rewarding Engagement Work for Associations?